Sharing a bottle of wine on Friday nights is something Jamie and I have done since our early months of dating. For my birthday last year, he planned a trip to Paonia, Colorado, where we toured the wineries and vineyards and sampled lots of good local wine. I love supporting local businesses whenever possible. The Denver area has a few wineries, although we're pretty short on vineyards, so the wine-tasting experience in the city isn't quite the same as it is at the actual vineyard. The other weekend Jamie and I stopped by the Boulder Creek Winery to taste a few of their wines. The last one was a sweet, rich port, which the server said would change our lives if we ate a few chocolate-covered espresso beans while sipping the port. The flavors of the chocolate and espresso with the port was a wonderful combination, and while I won't say it changed my life, it was so good that it inspired me to make these cookies. These cookies are soft and chewy, almost like a chocolate chip cookie but with hints of coffee and subtle bits of crunch from the espresso beans. The batter is similar to a classic chocolate chip cookie batter, although I substituted some low-fat cream cheese for butter to lighten them up a little. I also included some other variations on flavors and add-ins in the recipe below. I've heard of a trend of adding cornstarch to cookie batter to keep the cookies soft and chewy for people who don't like crisp cookies. I'm a big lover of the soft and chewy kind, and I will say, my cookies have never needed any special ingredients to keep them that way. I'm not bragging, I'm just saying, I don't make crispy cookies, because, quite simply, I don't overbake them. Baking them until they look like they're done means they will be way overdone by the time they set up out of the oven, because the residual heat in them continues to bake them even out of the oven. So the key to soft cookies? Take them out when they look underdone, and they will set up into very soft, gooey cookies. At any rate, I tried the cornstarch thing in this recipe just for the heck of it, and was really happy with the texture. They're soft and chewy, full of chocolate chunks, vanilla and a hint of salt. They were exactly what a cookie should be, and really delicious with a few sips of port. And although there's no red or pink in this recipe, or anything in the shape of hearts, I think this would make a wonderful Valentine's recipe. Preheat the oven to 350 F. In the bowl of your stand mixer fitted with the paddle attachment, beat the cream cheese, butter, brown sugar and granulated sugar on medium speed until smooth and creamy, about 5 minutes. Scrape the bowl down and beat in the egg and vanilla. In a separate bowl, combine the flour, cornstarch, baking soda and salt. Add the flour mixture to the mixing bowl in spoonfuls, mixing on low until combined. Stir in the chopped chocolate-covered espresso beans and chocolate chips. Batter will be very thick. Scoop rounded tablespoons onto a baking sheet lined with a silpat or parchment paper, spacing them 2 inches apart. Place a whole espresso bean on half the cookies. Bake for 8 - 8 1/2 minutes, just until pale golden. Don't overbake! Cool for 1 minute on the baking sheet then cool completely on a wire rack. To make the filling, beat the cream cheese and espresso powder (1/2 tablespoon yields a pretty subtle coffee flavor - use the full tablespoon for a more pronounced flavor) until the espresso powder is dissolved in the cream cheese (2-3 minutes). Add the powdered sugar, 1 cup at a time, mixing until smooth. Add the milk, and beat for another minute until smooth and creamy. Cover and set aside until ready to use. Take the cookies that are not topped with an espresso bean and turn them over. 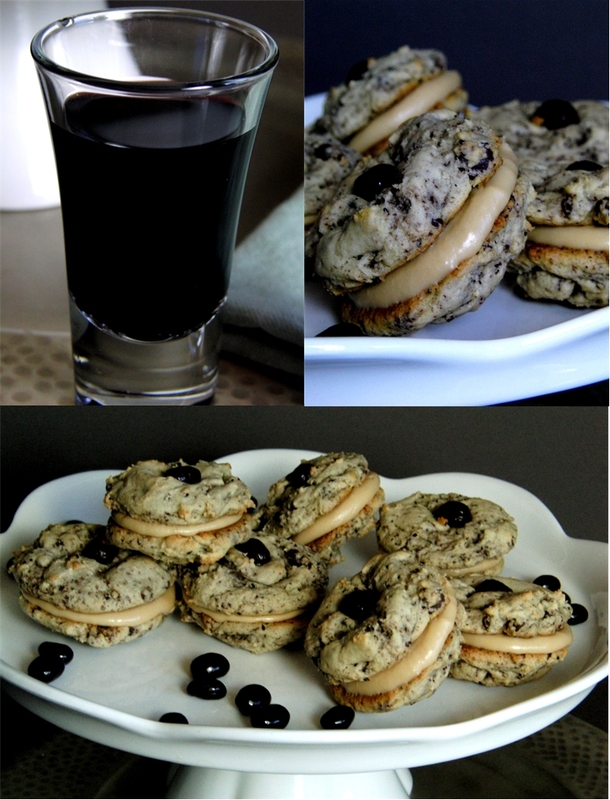 Scoop a dollop of filling onto each (about a tablespoon), and top with the cookie with the espresso bean. Repeat with the remaining cookies and filling. Refrigerate any leftover filling for another recipe. Chill the cookies in the fridge for about an hour to firm up the filling a little. 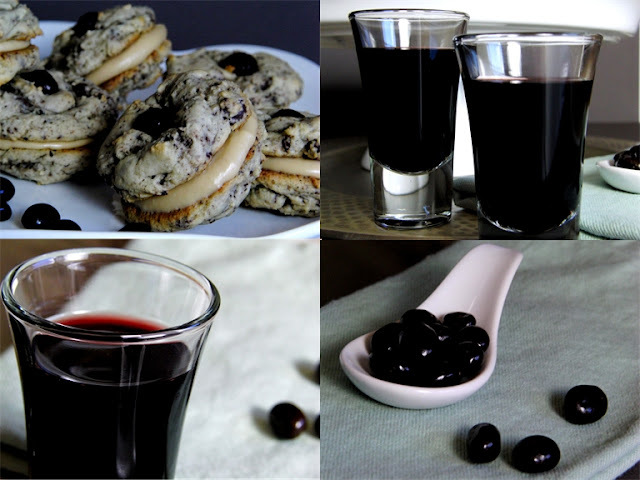 Serve with coffee, hot chocolate, port, or dessert wine. Yields about 3 dozen cookies / 18 cookie sandwiches. White Chocolate Mocha Cookies: Use white chocolate chips instead of bittersweet chocolate. Chocolate Chocolate-Covered Espresso Cookies: Swap out 1/2 cup of flour for 1/2 cup unsweetened cocoa powder. Chocolate Chip Cookies: Use all butter for the cookie batter instead of butter and cream cheese (1 1/2 sticks butter). Omit the chocolate covered espresso beans and use a full cup of chocolate chips. Omit the filling. Chocolate Espresso Filling: Swap out 1/2 cup of powdered sugar for 1/2 cup unsweetened cocoa powder. For a lighter cookie: Omit the filling and add a tablespoon of espresso powder to the cookie batter instead.